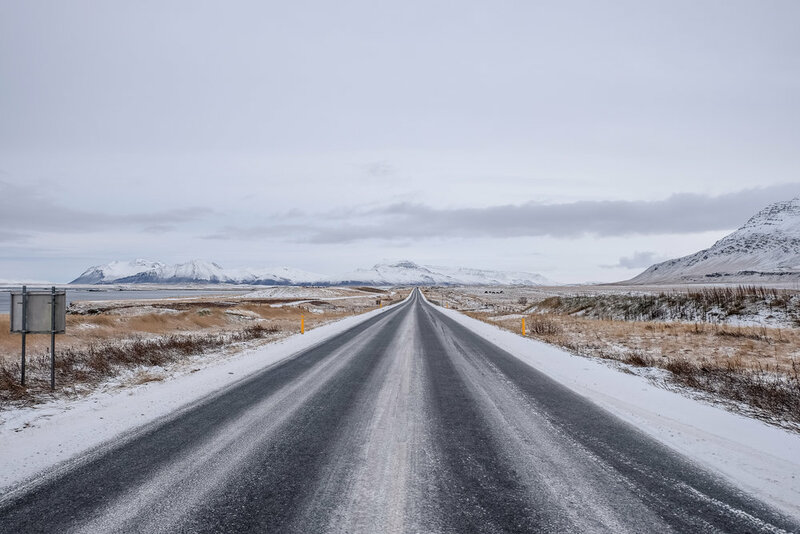 West Iceland is our top pick for a winter adventure through Iceland. We loved exploring the countryside while it was covered in snow. In our West Iceland travel guide below, we’ve got the best places to sleep, eat, and experience in the country. As always, use the table of contents to jump around. Sleep options in West Iceland are limited to a few solid hotels or Airbnb. Our favorites? A modern hotel located in the western center of Iceland. Rooms are simple but comfortable with beautiful views of the mountains. A gorgeous restaurant with panoramic windows and a fireplace serves yummy Icelandic food. The hotel also has a set of geothermal heated pools perfect for winding down after an adventure filled day. If you’re interested in doing the Into The Glacier tour we recommend spending at least one night here since the hotel is the jumping off point for day tours inside the glacier. Prices start at around $250 a night. Click here to see photos from our recent stay at Hotel Husafell. A freaking adorable guesthouse located on Snæfellsnes peninsula in West Iceland. We have to admit we had some reservations about what to expect before we stayed here, but we were so pleasantly surprised. The hotel has an electric charm that’s hard to pin down. Are you staying in a bed and breakfast? Someone’s house? Honestly we’re not sure. The stunning mountains surrounding the hotel will keep you occupied during the day. A well stocked bar with velvet couches and giant windows will keep you cozy while you search for northern lights into the late night. Click here to read more about our stay at Hotel Budir. Not a lot of food options out here in the West. We recommend the restaurants at the hotels in our sleep section above. A roadside coffee shop on the main road on Snæfellsnes peninsula that looks a bit like a creepy house from the outside and is significantly less creepy on the inside. They’ve got a long menu of espresso drinks, hot chocolate, and freshly baked cookies and super friendly locals behind the counter. It’s a perfect pit stop on a long day of driving. Calling all GOT nerds: you're headed North of the Wall. 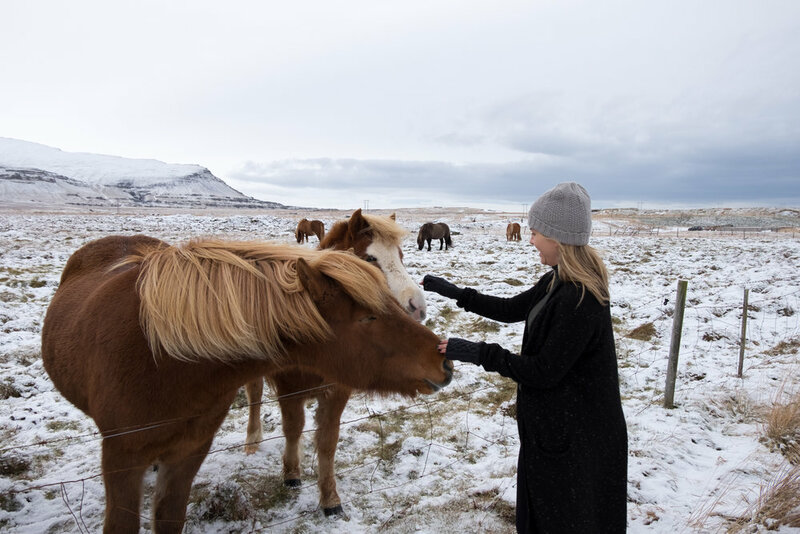 Iceland: where everyone is a horse whisperer. Yep, it’s true. Icelandic horses are insanely friendly. Park on the side of the road and stand at the edge of their fence and they’ll come trotting over for a little ❤️. We did this at least 5x a day. Snaefellsnes peninsula is a remote region in Western Iceland that's a few hours drive from Reykjavik. It's a magical place with stunning landscapes everywhere you turn and tiny fishing villages scattered throughout. 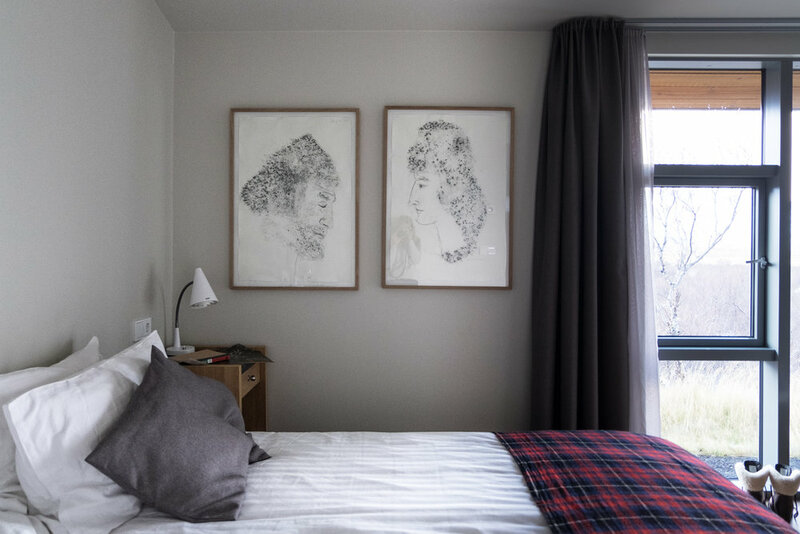 Hotel Budir (see sleep) is located on the peninsula and the perfect home base for a few days of exploring the peninsula's fjords, golden beaches, and lava fields. A 700,000 year old stratovolcano capped by a glacier which you can view from afar or actually hike up. Experienced hikers only! near the town of Grundarfjörður. The most photographed mountain in Iceland made even more famous by its appearance in a Game of Thrones. Interestingly, we thought the mountain looked deceptively unimpressive from the road. You'll want to pull over and get out of the car to hike up the waterfalls and get this stunning view pictured above. Wild Terrains tip: If it's stormy when you arrive, try to wait out the storm in the car. We arrived during a hail storm and almost abandoned our plans but the storm passed within 5 minutes and left us with this yummy peach colored sky. Our top experiences in West Iceland: geothermal pools, glacier trekking and the northern lights. Doesn't get better than that. Along our snowy drive from Reykjavik to Hotel Husafell we made a pit stop to soak our achy muscles in the newly opened Krauma Nature Baths - a set of geothermal pools heated by Europe’s most powerful hot spring, Deildartunguhver. It's so relaxing to sit in the hot water surrounded by fresh snow on the ground. Bring a bathing suit to change into and you'll use their locker rooms change and showers to rinse off before heading into the pools. Entrance fees cost around $36 per person with no time limit. There's also a restaurant on site. We call this work of art "I will taste glacier water even if I have to stand here all day." One of our absolute favorite experiences in Iceland is the Into The Glacier tour. The tour takes a few hours. You meet at Hotel Husafell (see sleep) and hop in a massive truck designed to take groups up on the glacier. Once you're inside the glacier there are tunnels and rooms to explore with the help of your guide. You learn really cool facts about how glaciers are formed and you'll have plenty of stunning photo ops like this one above. Don't forget to dress warmly! Tours start at $188 per person. Click here to read more and see photos from our Into The Glacier tour. Ugh. The illusive northern lights. We've been to Iceland multiple times and never seen them. Cloudy skies are more frequent than you might imagine, so it's best to keep your expectations low and be over-the-moon if you are lucky enough to see them. If you're going to see them, low light pollution and expansive skies in West Iceland make it one of your best bets. The hotels listed in our sleep section above both have northern light wake up calls in case they appear in the sky while you're sleeping. Good luck!